“Once Upon a Time,” gave us yet another episode packed with revelations. We got the full story behind what Charming and Snow did to Maleficent’s child. We also found out the fate of said child. Emma learned all about the lies her parents have been telling her for so long. And we finally met the author who appears not to be the most savory of characters. The main aspect of this episode was the story behind what Charming and Snow did to save Emma from the potential darkness she has inside of her. They go out and find a unicorn. Legend tells them that if they touch its horn they will get a vision telling them the fate of their child. Charming touches it and gets a calm vision. Emma is a brand new baby and seems happy and whole. He is happy and excited when he tells Snow. Thinking that what he sees is true. Snow on the other hand sees a completely different type of vision. She sees teenage Emma and she is not happy. This Emma is angry and resentful. She reaches into Snow’s chest, takes out her heart and crushes it with Snow watching. These two visions show that their child has two types of potential in her, just like any child who is a blank slate. She can be good or she can be bad. What interested me most about all of this was the fact that Snow’s vision did come true. Emma did not literally rip out her heart, she did it more figuratively. After Emma found out that her parents were lying to her this whole time she is understandably upset and angry. She leaves and Snow tries to stop her. She says, “But I’m your mother,” and Emma replies with “I don’t care.” This is the exact exchange from Snow’s vision. Despite everything they did, Emma is still crushing her heart. Emma, just like any child, was born with a blank slate. No child is born evil or good. They are born without understanding a thing about the world. In the end it is what surrounds them in the world that influences who they become. Snow and Charming are told after they did the spell on Maleficent’s child that they now have to guide their daughter. But no one guided Emma, she had to do it alone. All the decision that Snow and Charming made, they still have to watch their child turn away from them. No spell can take away that potential to hurt them. It all comes down to how the child is raised and what influences they live with. Snow and Charming did not need a spell to save Emma, they just needed to be there to guide her and watch over her. But they did do the spell. Snow and Charming are led to the Sorcerer who tells them that there is a spell that will take out all the darkness from Emma and put it into another vessel. But that vessel has to be as pure and as much of a blank slate as their child. They know that Maleficent has a child on the way and they decide to kidnap it and have it take all the darkness from their daughter. The Sorcerer does the spell and because of the dangerous potential the child holds he banishes it to our mortal world. When Snow is taking the egg from Maleficent she refuses to use the words child or baby when talking about it. When Maleficent asks how they could hurt a child Snow replies with it isn’t a child ,it is a monster. Despite all that Snow has done the idea of hurting a baby still stops her in her tracks. She cannot see Maleficent’s child as she sees her own. To do the spell the egg has to be nothing but an egg from a dragon that is a monster. Snow refuses to see that no matter who the parents are a child is still an innocent child. Plain and simple. Just because it comes from Maleficent does not mean that the child is going to be evil. Then they do the spell and Snow realizes that the egg actually held a human baby inside of it. She freaks out, begging to save the baby. It is in this moment when she sees the reality of what she has done. That baby was just as pure as the child she is carrying. They are the same and the fact that she just doomed this child to darkness as well to being banishes to another world is almost too much for her to take. Charming and Snow realize they made a horrible decision and that in their fear they hurt an innocent life. We see that Snow can’t get past what they did to Maleficent. Everything she sees and does reminds her of the choice they made. She is desperate to do something to fix it but knows that there is nothing she can do. Charming takes her aside and tell her that the decision they made was a horrible one. They both acknowledge that they hurt someone and that what they did was no better then many of the things that Maleficent did. Snow tells him that what they did “was brave but was not kind.” In this moment Charming tells her that for now on they will live a kind life. They will spread hope and faith throughout the kingdom. They will help who they can and try to live pure lives. It is this moment that makes them the heroes to me. They made bad choices, they hurt others. But they do not shrug it all off. They live with it everyday and they are desperate to change what they did. A hero tries to help and take care of others even when they aren’t the best person themselves. The Charming’s, in this moment, make the decision that in order to correct their mistakes they will live good lives. They cannot undo what they did but they can strive to live better from now. We all makes horrible mistakes when we are scared and emotional, it is how we react to those mistakes and how we try to fix them that makes us heroes or villains. When we met Lilly she wasn’t some sadistic kid. She was just as lost as Emma. They both feel like they do not belong in the lives they are living. They both are looking for more and they find a kindred spirit in one another. Emma is supposed to be full of pure light while Lily is supposed to a hold all this darkness yet they are able to get along and feel connected to one another. They formed a bond that Emma still regrets breaking to this day. She tells Hook that Lily was her friend. They were friends, despite what the potential they are supposed to harbor inside of themselves. Snow and Charming were told that all the darkness was taken out of Emma but young Emma wasn’t some pillar of good. She ran away multiple times, she stole and she made some very poor choices. So how much did the spell actually do? If Emma was supposed to have no darkness left in her why would she have such a troubled early life? That is because the potential she held had to be nurtured. She needed someone to show her the right choice to make. As I stated earlier no spell is going to make her good. She has to make the choices and she can’t make the choices if she has no one to show her the way. This all leaves a very open ended question about Lily. Where is she? Is she incarcerated and a horrible person? I highly doubt it. I feel like she is in the same position Emma was in when we first met her in season one. She is lost, and does not know what she is supposed to do or be. She has no one on her side and she is scared. She needs a guiding hand just like Emma got. I can’t wait to see these two meet again. I want to see them help everyone else realize that it isn’t what you did in the past that matters or what someone thinks you can do or be it is all up to you and you alone. You make the choices that control your life. Emma and Lily may have made poor choices but they also made positive ones at the same time. They are not controlled by this potential that so terrified their parents. Emma and Lily had no one making choices for them but we see that our other characters may not have been so lucky. We met the author in this episode and he is not the greatest person. The role of the author is supposed to record the stories of these people. They are supposed to do nothing but observe and write it all down. But this author thought that was boring and he was manipulating the stories. He was the one who led Charming and Snow to the Sorcerer in the first place. He was the one who wrote the Sorcerer banishing away Maleficent’s child. His excuse was that it made a better story. So how much did he actually influence everyone? What decisions did our characters make on their own and which ones did he have a part in helping them make? Did he have a hand in influencing Regina not to meet Robin Hood? Was he responsible for young Snow telling Cora about Regina’s boyfriend? Judging by the few minutes we met him he doesn’t seem like the helpful kind. He ran as soon as they mentioned they had questions so getting him to do what they want doesn’t sound like an easy task. But do they want him to do anything? If he undoes all that he initially messed up where will we end up? This feels similar to an altering time story line. You mess with one piece and it touches everything else. It will be interesting to see if he does anything and what the results of his actions. Rumple wasn’t in this episode much but the part he was in was telling. 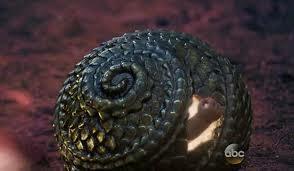 He goes to find a sleeping Belle (she was under a sleeping spell by Maleficent along with the rest of the town). He tells her that he knows that he has a massive debt to pay for all the magic and harm he has done over his life. He knows that the only way to clean up that debt is to change the story. Then he tells her that “something is changing,” and that he has to do this all quickly. This is where he lost me. What is changing? While he was saying this he was holding his chest, possibly his heart. Is he dying? Is Rumple losing his heart or will to live in some way? Is this changing the story his only way to live on? Something is off about what he was saying to Belle. I doubt whatever is changing has to do with Belle being with Will. I feel like it is something bigger then that. Rumple finishes his speech by telling Belle that he will come back for her if he can. This is a very telling statement. Up until now I have assumed that whatever Rumple’s happy ending is, it involves Belle in every way. Now we see him saying that he may not be able to come to her again. Why? What does he actually want? Does it not involve Belle exclusively? Does his love for her not trump something else? I am very interested to see where this conversation takes us. “Darkness if funny thing, it creeps up on you,” – Hook- He is concerned that Emma does not understand how dangerous darkness can be. You don’t realize it is taking over until it is too late. But hopefully Emma knows enough and has enough support that she won’t be lost to it. “Heroes do what is right, not what is easy,” – Snow- Her and Charming choose wrong at one time. They chose a spell to help their daughter. They wanted a quick solution instead of taking the harder path. They learned their lesson. When you do what is easy you can hurt others. It would have been better for them to take responsibility of their child’s future and ensured she was good by their influence and parenting instead of some spell. “You’ve sure come a long way from the woman who couldn’t believe,”- August – This is a great way to sum up Emma’s evolution throughout the seasons. At one point she refused to see her true life and the truth and now she is fighting for all of it with all she has. When will we see her again? Is Lily dark? Or is she like Emma was, lost and needing guidance? Will she forgive Emma for abandoning her? What is wrong with Rumple? What is changing so quickly for him? Does Rumple’s ending involve Belle? Can the author change what he messed up in the first place? What were the original stories of our characters supposed to be? Do we want the author to do anything? Will any changes be for the better or for the worse? Did he transport Emma from the mansion to the town square? Why did he do that? How much power does he actually possess? Is there a more current author right now? Is Rumple going to use Robin to make Bella work with him to hurt Regina? Was her Regina’s dream warning her about what Rumple is up to? Will we Emma go dark in any way? Posted on March 30, 2015, in Once Upon a Time, Tv Shows and tagged 4x16, Best Laid Plan, Charming, Emma, Lily, Malieficent, Once Upon a time, Snow, tv show review. Bookmark the permalink. Leave a comment.